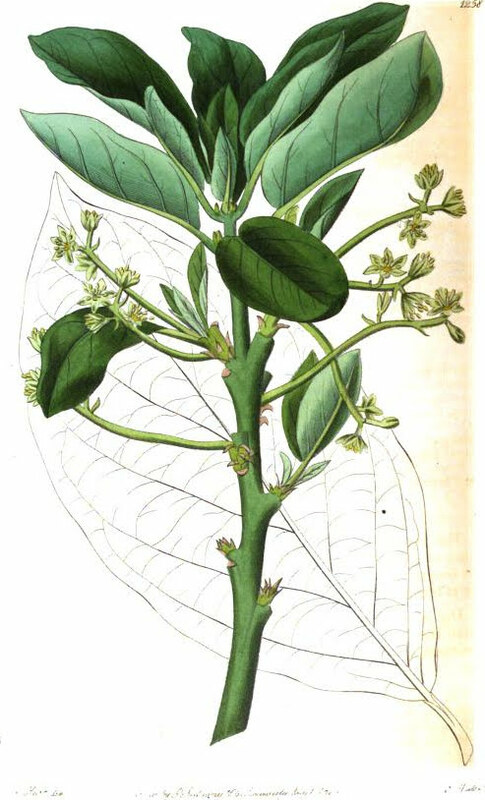 The avocado, once called the Alligator Pear, appeared in books since the early 17th century, and by mid 1800s in London was "much eaten by all classes of people." In 1696 Hans Sloane was able to cite numerous names for the fruit from books. Originally from Mexico, it was grown in the West Indies, St Augustine (1766) Florida, and California in the later part of the century. Claimed to taste like chestnuts, was "superior to the peach" and often served as a salad with French dressing (recipes below). The Avocado, or, as it is often called, Alligator Pear, is one of the most esteemed fruits of the West Indies. In this country it is only cultivated in the stove [greenhouse], of which it is one of the rarest species. Our drawing was made in the princely Garden of his Grace the Duke of Northumberland, at Syon,—an establishment which, whether we view it with regard to the Botanical or Horticultural interest that attaches to it, promises to be soon the most important, as it is already the most magnificent, in Europe. "This tree grows commonly to the size of our largest apple-trees in Europe, and spreads pretty wide at the top. The branches are very succulent and soft, the leaves oblong and veiny, and the fruit of the form of a pear; but the pulp is covered with a tough skinny coat, and contains a large rugged seed, which is wrapped up in one or two thin membranous covers. The fruit of this tree is one of those that is held in the greatest esteem amongst all sorts of people in these colonies: the pulp is of a pretty firm consistence, and has a delicate rich flavour; it gains upon the palates of most people, and becomes soon agreeable even to those who cannot like it at first; but is so rich and mild, that most people make use of some spice or pungent substance to give it a poignancy; and for this purpose, some make use of wine, some of sugar, some of lime-juice, but most of pepper and salt. Most sorts of creatures are observed to feed on this fruit with pleasure; and it seems equally agreeable to the horse, the cow, the dog, and the cat, as well as to all sorts of birds; and when plenty, makes a great part of the delicacies of the negroes. "The tree requires some care, a rich soil, and a warm situation, to raise it to perfection. It was first introduced from the continent." “The tenderest plants of the West Indies, such as the plantain, the alligator pear tree, the banana, the pine apple, or ananas, the sugar-cane, &c. remain unhurt during the winter, in the gardens of St. Augustine. At least twenty-five varieties of California origin have already been described and doubtless as many more are being propagated and heralded by enthusiastic owners or nurserymen. In addition, more than a score of varieties from other countries have been introduced and are being propagated by the thousand in some cases. The most common question asked of avocado men today is, “Do you really think the avocado will become an important commercial fruit ’’ and they usually answer “I really think so’’. The Avocado pear (Sausus persica), sometimes called the Alligator, is a West Indian fruit, about the size of the apple. Its pulp is very delicious, and considered superior to the peach. In the South, the alligator pear, with French dressing, makes an appetizing salad; and lobster, crab flake, and shrimp salads are, these days, almost always with us. 1880 Murrey, Thomas. Valuable cooking Receipts. Alligator-Pear Salad.—This tropical fruit, that tastes something like our chestnuts, is beginning to find favor among us, but care should be used in selecting the fruit. The green colored fruit is the best; the black, over-ripe fruit is useless. Cut the pear in two, remove the large seed, cut away the outer rind, then cut the fruit into strips and season with a salt-spoonful of salt, two tablespoonfuls best Virgin olive-oil, a teaspoonful of tarragon vinegar—nothing else. Alligator-Pear Salad.—This tropical fruit is excellent as a salad; all first-class fruit-dealers have them when in season. 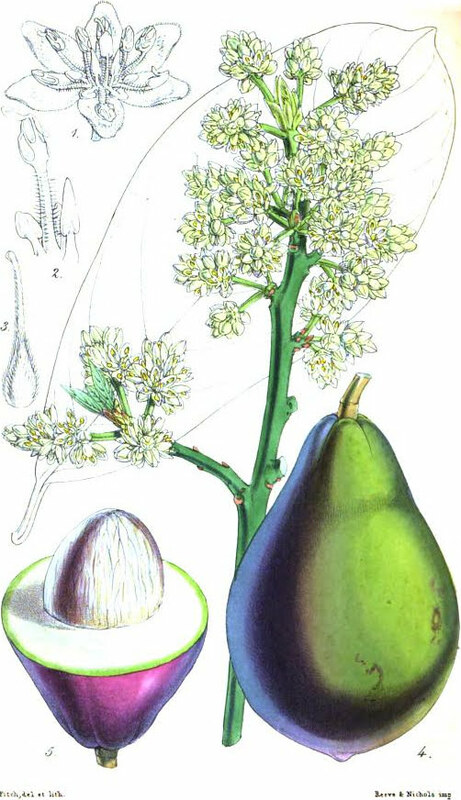 The black-colored fruits are over-ripe, and are not as good as the firm, green-colored pears. Cut the pear in two, remove the large seed, and cut away the outer rind; then cut the fruit into strips and put into a salad bowl; add a plain salad-dressing. A Cuban friend of mine invariably adds a little onion to his pear salad, but he uses very little pepper. Alligator-pear is the fruit of a small tree of the laurel family (Persea gratissima), native of tropical America. Two small trees may be seen at the Everett House Cafe, grown from seed originally started in bottles of water. The aguacate, or alligator pear, is found in foreign fruit stores. It is obtained from a West Indies tree; is shaped somewhat like a pear, has a very thin rind, and an extremely large seed-stone. A good-sized aguacate weighs about two pounds, and costs from fifteen to twenty cents. In New York there is a fruit store on Fulton Street, near Fulton Market, [interviewed below] where this fruit can almost always be had. For a salad, use one good-sized aguacate, the tender white leaves from two heads of lettuce, a Spanish onion, and half a pint of Mayonnaise dressing. Cut the onion into very thin slices. Pare the aguacate, and cut it into thin rings. Wash the lettuce, keeping it as crisp as possible. After putting two of the leaves together, place a slice of onion upon them; over the onion lay two rings of the aguacate; and in the centre of these rings put a heaping teaspoonful of Mayonnaise dressing. Dispose of all the material in this manner, and after placing on a flat dish, serve at once. The onion may be omitted if its flavor be disagreeable. How to make the salad.—“These are aguacates, alligator pears, or vegetable butter, or whatever of the several names you please to call them. They come from Cuba,” said a Fulton market dealer, in answer to an inquirer, pointing to a heap of glossy, green fruit, looking like Hubbard squashes in miniature. “They are used as a salad,” he continued, rapidly selecting specimens of the fruit, three of which filled a square grape basket. Several of these baskets were directed to the navy yard. “Naval officers, who have learned to eat aguacates in the tropics, are very fond of them,” added the dealer in explanation. “They leave a standing order for me to send over aguacates whenever they arrive, which is a mighty uncertain time. What will arrive, and how it will arrive, and when it will arrive is a mighty uncertain thing, dealing with those folks at the tropics. If they are out of money, they will send on fruit; if they are not, you can wait for it. They say it's the climate. I guess it is. I have seen Northern men go down there, and at the end of two years they did not care to work any more than anybody else. Sometimes a cargo of fruit, with aguacates on board, arrives in summer, when they must be kept in a refrigerator. To make a first-class aguacate salad, you must have Spanish onions. Peel the onion, cut it in very thin slices, lay it on your salad dish on a bed of bleached lettuce, if you want to. Then peel your aguacate, remove the large pit and cut the fruit in slices; lay it on the onion,they must all be ice-cold,—then pour your mayonnaise dressing over them or in the center of a ring of sliced aguacates arranged on the onion, and the salad is ready.”—New York Tribune. Aguacate salad is made of mashed aguacate, onions, and cheese, while a "tomale" which I dissected was found to be made up of a combination of chicken, onion, red peppers, olives, and raisins.